I hadn’t really heard a lot about this website but it seemed to keep popping up as I was looking around the subject of disabled dating, so I felt it was only fair to have a closer look. It’s brown! Brown hardly screams love, passion, romance, does it? Not at all! Who would want to be signed up to a BROWN dating website?! It’s far too fussy too. I presumed this was a freebie disabled dating website very easily on from the vast amount of Google ads that seems to be plastered all over the home screen alone. I kept seeing all these ‘success stories’ popping up on the right hand side and all I could think to myself was HOW? *Turns out, it’s not a free website after all. Why would you need a promo code if it were free? It gets really complicated after you login. There’s all this stuff on the page about ‘membership days remaining’, and ‘non-mandatory profile questions answered’. It was just too much for me, and I realised at that stage I wouldn’t be upgrading my membership. Again, there seemed to be references to paying for services somewhere. It took me a while to find out where. 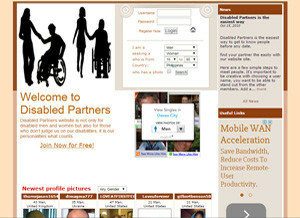 You only have one membership option with DisabledPartners.com. That’s it. Just the one. It’s not even a good one – you have one option of twelve months for £15. Great value for money to be fair, but why would you want to commit to a website for that long? What happens if you meet the man or woman of your dreams in the first month of being on the site. You have wasted eleven months of membership! It just doesn’t make any sense to me why they wouldn’t have a month-by-month option. I’m certainly not paying for that. On my first page of profile pictures, I had Avril Lavigne and three profiles without a picture. That’s the honest truth. Obviously not the real Avril Lavigne, but someone with their profile picture as her. Why do people do that? It looks ridiculous – internet daters, you shouldn’t do this! The mix of women seemed decent enough with an age range of around 18 to 46 (from what I could see), although there didn’t seem to be a massive amount of members. When I did a generalised local area, there was under 60 profiles for me to browse. That’s it? I could veto most of those in the next fifteen minutes and then what would I be left with? *Oh, great value for money! *Horrid website – brown, really? !